East Jersey State Prison is located in Rahway New Jersey, part of Middlesex County. It houses approximately 1,500 adult male offenders of minimum, medium and maximum security. The prisons distinctive large dome and forbidding front gates have made it featured in many films and shows. 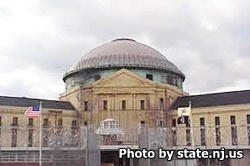 This facility is also known as Rahway State Prison, although the name was officially changed to East Jersey State Prison in 1988 at the request of township residents. Offenders housed at East Jersey State Prison can participate in vocational courses that teach inmates automotive repair, auto body repair, horticulture, culinary arts, and painting. Additionally, inmates can receive an adult basic education, earn a GED and even take college courses offered through Union County College. This prison was the location of the original "Scared Straight!" program, where inmates sentenced to life terrified young juvenile delinquents into making changes to their lives. East Jersey State Prison Main facility has contact and non-contact visits. The maximum number of visitors is up to six adults, this is only if space permits it. Contact visits are conducted on Saturdays and Sundays in two sessions. The first session is from 9am-11am; registration for the first session is between 7:45am-9am. The second session is from 1pm-3pm and has registration between 11:45am-1pm. Non-contact visits behind a window are on Saturdays and Sundays in two sessions. The first session is from 9am-11am and the second session is from 1pm-3pm. All window visits are one hour in duration. Thursdays from 5:30pm-7:30pm (registration is between 5:15pm-6:30pm). Saturdays and Sundays in two sessions. Session one is from 8:30am-11am (registration from 8am-9:30am) and session two from 12:30pm-3pm (registration is between 12pm-1:30pm).